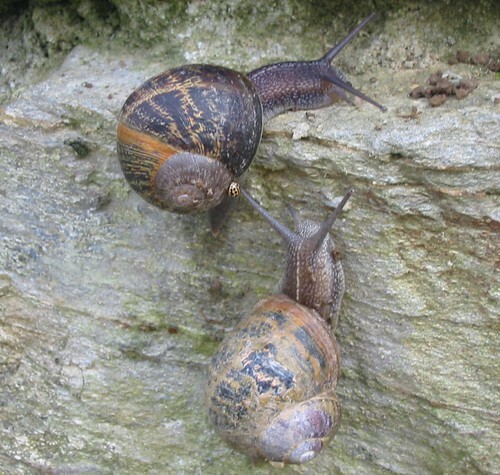 This picture from 2006 when we first started living at the farm revealed an unnoticed detail today when I was flicking through looking for snaps to illustrate the post; a tiny yellow 22 spotted ladybird hitching a ride up the wall on the side of a snail. The year is nearly a twelfth of the way through and it still feels like we're in limbo waiting for the start. I was trying to avoid spending a lot on seeds this year so I've not been studying catalogues or making many plans, typical activities for January gardeners and the wet and windy weather has meant more days huddled inside than bright brisk days noticing the natural advance of spring. I have swapped some ulluco with other enthusiasts and taken in return salmon flowered peas, rocambole and some different varieties of ulluco so some new projects are under way. I've also requested seeds from HSL but unusually they are very late in returning my order, I'm hoping it hasn't been lost in the post. I'd been anticipating getting some Shark's fin melon and Dudi from their SNS section. It's time to make a seed potato order. I'm wondering if it would be sensible this year to reduce the number of varieties right back to three or four of our absolute favourites. We love our spuds but I'm thinking I'll have more time for other crops if I simplify the planting of these core essentials by sticking to varieties that I know grow without trouble and have some blight resistance. Maybe I should start those plans now - is everyone else organised yet?